The more I support with my economic plans the building of a middle class, the quicker they're going to turn around and say, 'Hey, we want a bigger say in things.' So, I knew what I was getting into right at the beginning. It's the right thing to do. And as an American colleague said to me several months ago, he said, 'I think the challenge in Jordan - and, again, this is for the rest of the Middle East - we need to define what center is. 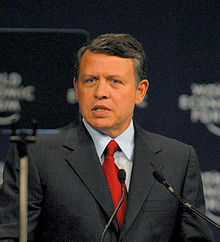 And once we can define what center is to a Jordanian, then we can decide what's left and what's right of that.